We're taking a look at styling the diamond. Shilla coat. Daniel Wellington watch. Chloé bag. Miu Miu heels. What I didn't know about getting engaged is that accessorizing the ring can be a tough task. I'm so in love with the most beautiful possession I own, because it's my first, nicest piece ever, but frankly none of my current jewelry collection matches up to the ring. I used to wear a ton of gold jewelry with a matte finish for a minimal look; now with the diamond, they fall a bit inadequate. My goal for 2016 is to deliberately upgrade my jewelry collection to include more polished rings and bracelets of shiny silver and gold for styling the engagement ring. I'm thinking something thin like this ring from Barney's or something pave and chic like this one with a pearl accent. The same goes for watches too! 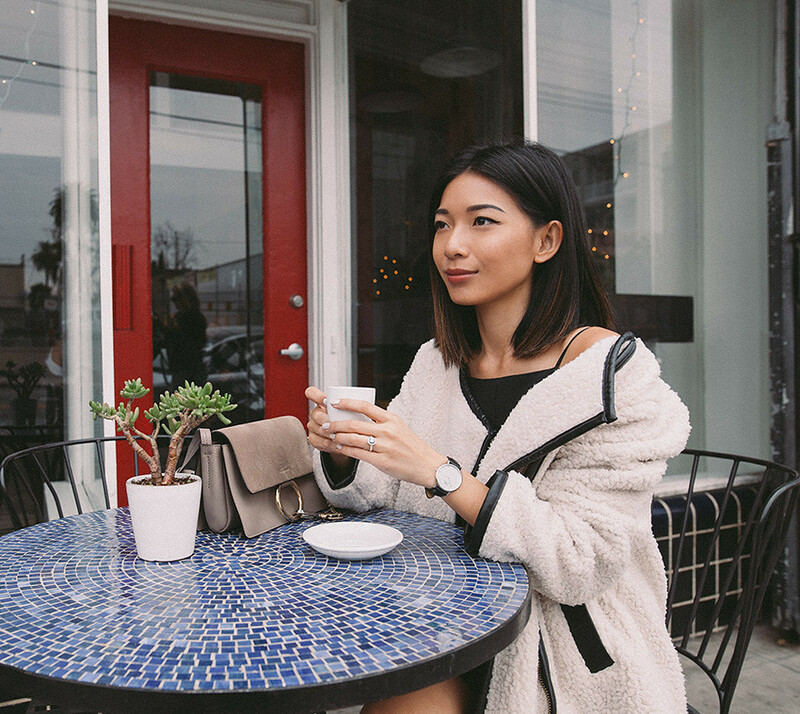 Every watch of mine has a gold-rimmed face that didn't look fitting on my left wrist, so I went back to Daniel Wellington to get a couple of silver-faced watches to start wearing on a daily basis. 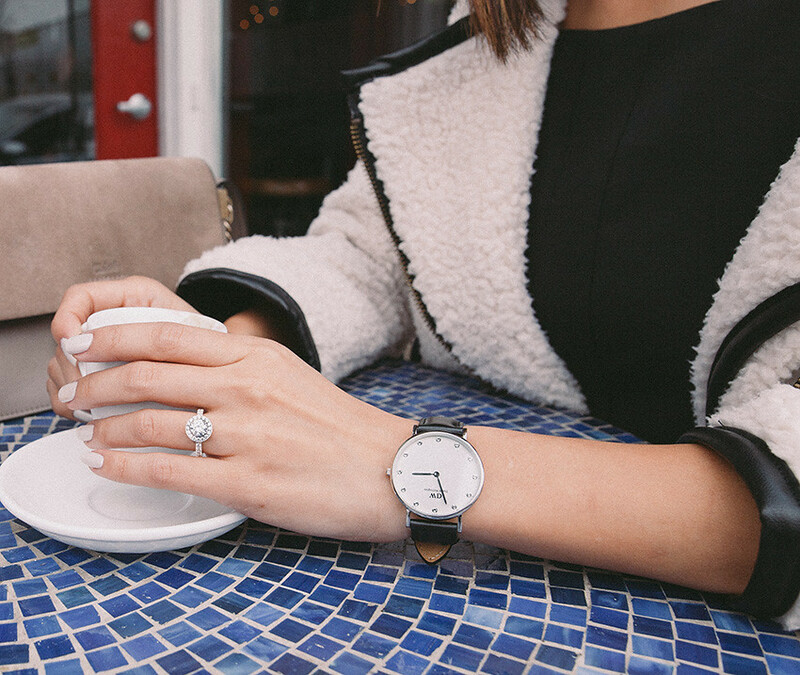 For a dressier occasion, I love the Daniel Wellington Classy Sheffield watch, with a glittering Swarovski crystal index that effortlessly accentuates the sparkle of my ring. My other buy, the Classic York with the dark brown crocodile leather band, is beautifully timeless for a casual outfit to brunch or a work meeting; its silver dial just simply elegant and perfectly matched to platinum. Don't get too matchy matchy and only wear silver for the rest of your life after the proposal! Mixed metals give a unique, put-together look that pops. Just expand on your options in silver and gold and your diamond ring will have never looked so good. So plan ahead! Think of your dream engagement ring and start preparing your jewelry wardrobe early and you can dress up that ring as soon as you say yes! To help you out, up until February 15th, you can get 15% off at DanielWellington.com with code 'HONEYNSILK'. Beautiful! I love your jacket! Such a great look, love that sweater! Congrats again!